We found this book on our first trip to the library in 2016. And it is beautiful. This is the story of a boy who wonders about things. He wonders, and his wandering mind gets him into trouble. He wonders where the birds are flying to, and is reprimanded by the park keeper for almost stepping on the grass. Over the park keeper's shoulder is a burst of color. He wonders who makes the clouds, and almost bumps into another bus passenger. He wonders what the crossing guard's signs tastes like, imagining it a fancy, swirly lollipop. He wonders what the best playground in the world might be like. Faye Hanson renders the real world is soft sepia tones, while the boy's imaginative musings are seen in vivid color. Things change when the boy gets to art class. He doesn't know what to draw. "Just use your imagination," says the art teacher. These photos I took? Tiny bits of spectacular double-page spreads. Seriously, the art in this book is simply gorgeous. You could stare at it for hours, picking up all the details. As you can imagine, the boy's art is a success. "What an incredible imagination you have." 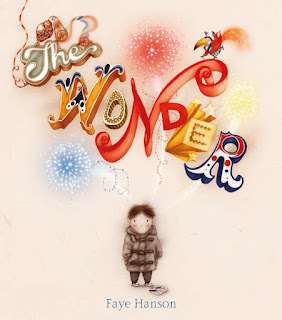 "Which of course is true, because this is a boy whose head is filled with wonder. Enough to share with everyone." The book closes with one more two-page spread, a glimpse into the boy's future as an artist. 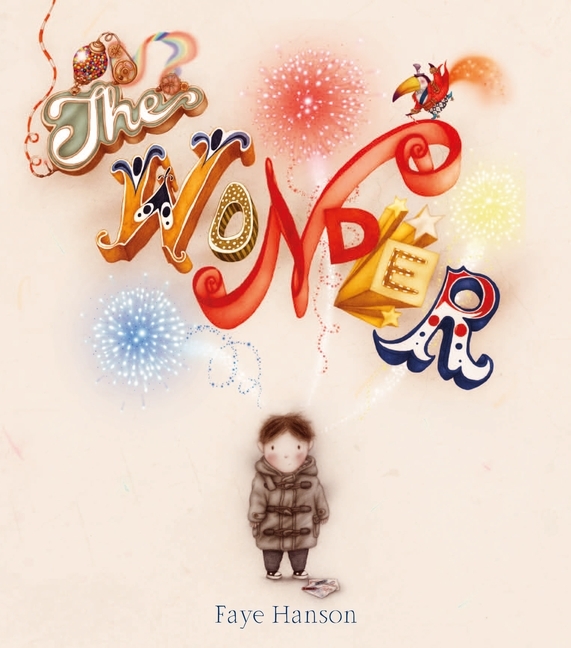 The Wonder is a beautiful book, and was recently nominated for the Kate Greenaway Medal. [THe longlist won't be announced until February.] Faye Hanson is based in the U.K., and has a couple of novelty books to her credit, She also illustrated a couple of books by Michael Morpurgo that are not available in the United States. She has another picture book slated to be published this year. I hope it makes it to this side of the pond! "The Newbery went to Matt de la Peña for Last Stop on Market Street!" The girls were very happy to hear it. I agree, the story resonated with us as much as Christian Robinson's great illustrations. I've read a lot of grumbling about a picture book winning, but I think it's about time that a picture book is recognized for its literary merit. You know, Big Sis is ten years old, I'm in my late 30s, and Little Sis is eight, and we still read picture books regularly. A good story is a good story, and this one in particular had something to say. We were also extremely happy to see the love shown for our beloved Jerry Pinkney. He received the Laura Ingalls Wilder Award (a kind of lifetime achievement award) and the Coretta Scott King-Virginia Hamilton Award for Lifetime Achievement! Congrats to all the honorees! I found a great many books I need to check out. There are always so many more greats than there are awards, and I'm grateful to all the bloggers and websites that debated over the year. So many suggestions!